Hyatt Training is owned and operated by husband-wife team Jeremy Hyatt and Lee Carson. They bring 30+ years of professional experience to Hyatt Training and are dedicated to creating the best Portland personal training gym. 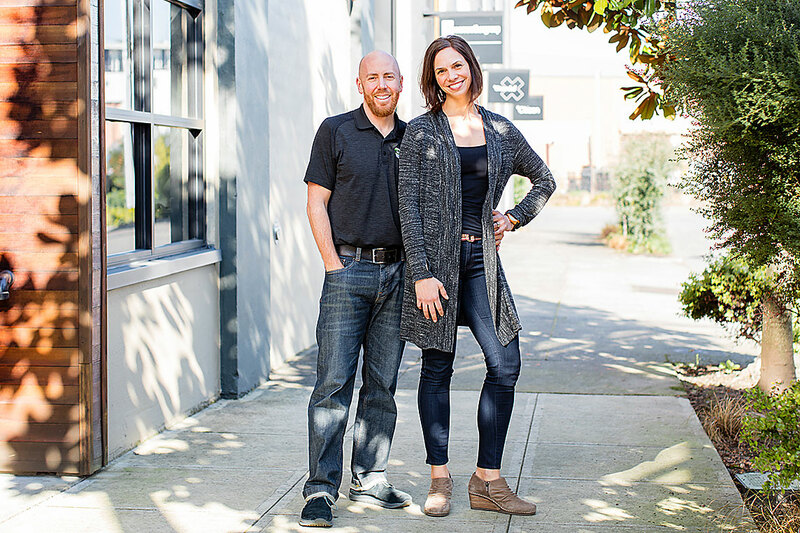 Jeremy and Lee created Hyatt Training because they believed whole-heartedly that one-on-one personal training is the best way to get the most out of your workout time. Hyatt Training opened in 2011, and it’s been at its current location in the Fitzgibbons Glass building since August 2017. Jeremy leads Hyatt Training on the health and fitness front. He has 18 years of experience working one-on-one with clients. He holds a Certified Strength and Conditioning Specialist (CSCS) credential, which is considered to be the gold standard certification in personal training. His specialties are assessing client needs and keeping workouts varied, effective and interesting. These specialties shine through in his client retention rates—his average client has worked with him for 6+ years and several for more than a decade. During his 16-year tenure in Portland, he’s built a strong community of like-minded fitness enthusiasts. A natural educator, Jeremy has a bachelor’s degree in education and a master’s degree in kinesiology. Lee leads the business side of Hyatt Training, using the marketing, strategic planning and project management skills she honed during her 12-year career in the nonprofit sector. Prior to Hyatt Training, Lee held leadership positions at three nonprofits. She is particularly adept at assessing needs, creating strategic direction and implementing her plan for results. A yoga teacher since 2008, Lee applies the high standards learned in the business world to fitness. She understands both the applicable parts of running a business and the skills and passion required to serve her clients on their health and wellness journey. She earned a double major in international business and psychology from Washington University in St. Louis. Jeremy and Lee are passionate about creating an environment where both clients and trainers thrive. For clients this means superior customer service, utmost cleanliness and unparalleled attention to detail. For Hyatt Training personal trainers, this means being a flat out awesome place to work including a beautiful studio, top-notch equipment, reimbursement for continuing education and tons of support as they build their businesses. The mix of these two elements are the foundation of the thriving Hyatt Training community, and Jeremy and Lee invest time and resources in both every single day. Hyatt Training core values are the heart, soul and guiding principals for every decision day in and day out. Staying true to a steady set of values ensures our clients receive consistent results for their entire personal training experience. Health is the cornerstone of a great life, and we help our clients seamlessly integrate wellness into life by optimizing their workout time. But we’re more than just a good sweat. We help our clients achieve some of their biggest life goals and feel their very best. We see ourselves as guides on our clients’ health and wellness journeys. While we take what we do very seriously, we refuse to take ourselves too seriously. Having fun along the way is important to us. We promise our clients they’ve never had so much fun working so hard! We strive to go above and beyond our clients’ expectations, always giving 110%. We believe in making the world healthier, one person at a time and look for every opportunity to make our clients and community stronger and healthier. The people who walk through our doors are the heart of Hyatt Training. We’re continually investing in ways to keep our community vibrant and thriving. As personal trainers, our number one job is to share our expertise and passion. We hold ourselves accountable to the highest standards of continuing education. We strive to stay on top of the the latest trends and research to always be at our best. We’re dedicated to educating our clients, ourselves and the community at large. Being part of a community has measurable positive impacts on overall health by helping people stick with fitness goals. Plus, it’s a lot more fun! And while we’re passionate about what happens inside our studio walls, we care just as much about what happens in our Portland community and beyond. We’re committed to reducing, reusing and recycling everything we can and using products that are healthy for our members and the planet.